Over the years, I increasingly harbored my own perspectives on various situations and issues encountered. As my language skills improved, I began contacting involved parties to express my views and suggestions. Below are some letters that I wrote to the government, corporations, and organizations, starting from last year. Such exercises reinforced my belief in analyzing different circumstances and voicing my opinions when necessary. Certainly these are also good writing practices as well. I am sure that I shall continue to do so over the rest of my life. In March last year, I subscribed to the AAAS’s Science magazine and began reading this prominent scientific journal. This year, I did not renew my membership in March, and my membership should have expired by now. 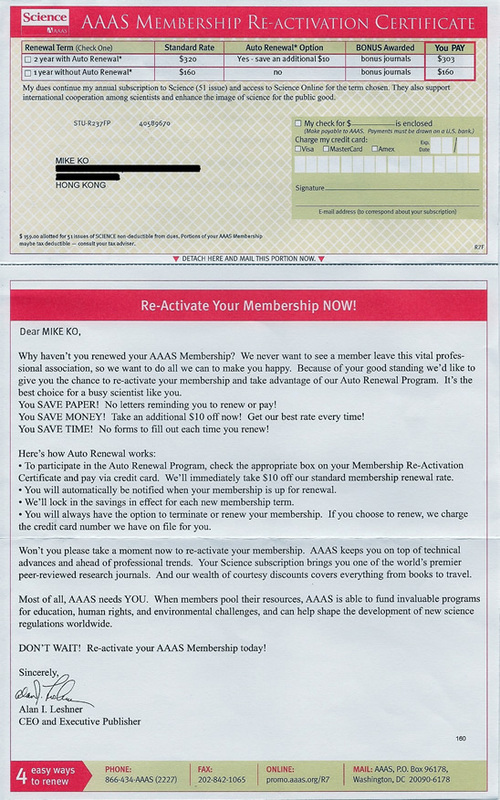 But before it did, the AAAS has actively sent reminders to persuade me otherwise. In addition, I continued to receive issues of Science as of June 4. While I appreciate these extra issues, they were completely unexpected. Despite these incidents, I have already made up the mind to discontinue my subscription. In the following I shall explain why. Although the membership department may not realize it, I am actually an 18-year old home-schooled student. As a resident of Hong Kong, I subscribed to an American magazine because of its outstanding contents. For each issue I typically focus on the news and reports. While the reports can be quite technical, my point is to get accustomed to scientific writing styles. With time, I began to understand more. Yet with Science’s publishing rate of one issue a week, I still have a lot of unread issues. Even with my selective reading approach, I think my magazine supply shall last beyond this year. As such, I cannot possibly manage another year’s worth of Science. Plus, the articles’ publishing dates are unimportant for my purposes. This is the reason why I decided to end my subscription to Science. Please rest assured that it has nothing to do with the quality of your magazine. It is simply imprudent to maintain my subscription. However, please halt the continued mailings of further issues of Science. Despite this, I shall certainly consider re-subscribing in the future, when I begin my university studies. It has been a while since I received your reply on MSF’s fundraising efforts. I am heartened that more than 90 local schools have offered their support. May the MSF continue such efforts and reach out to the rest of the 1300 primary and secondary schools in Hong Kong. 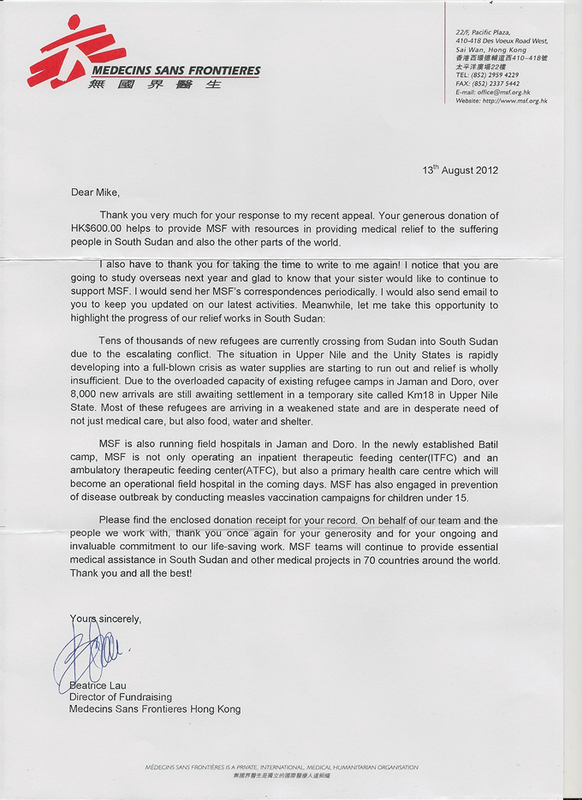 Recently I have received your letter on the MSF’s ongoing efforts in South Sudan. The events that are transpiring there are truly regrettable. I agree that safety is of the highest priority in conflict zones. Despite the fact that MSF’s personnel are offering humanitarian aid, situations in these areas can quickly deteriorate. I understand the urgent need for medical resources by the MSF to help the less fortunate. My younger sister, Amélie, has also read your letter and shares my sentiment. As such, we intend to make a humble, collective contribution of HK$ 600 to the MSF’s from our allowance. I would also like to make a change to the recipient of the MSF’s fundraising letters. As I will be entering university overseas next year, I may soon be unable to make direct donations. However, my sister has an interest in periodically supporting the MSF. So you may direct any future letters on MSF’s activities to her at our current address. In general, our whole family shall definitely consider making more donations to the MSF in the long-run. Some time ago I received your fundraising advertisement letter by mail. Initially I was somewhat curious on why MSF has obtained my personal information without any previous contact. Yet it did not seem too surprising afterwards, as I have ongoing subscriptions to several magazines, including Science and TIME. It is probably from one of their databases that MSF has acquired my personal information. From various different sources I have heard of MSF’s efforts to aid people in need. I greatly admire your organization’s dedication, and agree that we should actively help those lacking medical expertise. However, I am just an 18-year old student with no regular income. Furthermore, I am currently planning to study overseas soon. Hence it will be difficult for me to commit monetarily on a regular basis, as suggested by your letter. Still, I can make a single donation of a modest HK$500 for now. Enclosed with is the bank direct transfer slip for your reference. Aside from this one-off contribution, I also have a suggestion. On this occasion you appealed to – perhaps inadvertently – a student for donations. Students may not be MSF’s conventional target group, but young people’s financial power should not be ignored. Therefore, MSF can directly appeal to Hong Kong students, be they from primary and secondary schools, or even universities. MSF can reach out to students by hosting exhibitions or talks in schools. Such events can educate them on the unfortunate situations that other people face, as well as cultivating compassion. Students may also be motivated to help these people in need of help with their pocket money. Such donations may be small, but the number of potential donors can turn that into a significant contribution. Collaborations with school management, social workers, student unions, and parents can magnify the effect, either through direct funds or event organizing. So MSF can consider connecting more directly with students and schools. They can be a significant source of potential funds. Plus, such interactions can have long-reaching effects on society, by nurturing a generation that readily helps others. Further to my reply to you of 13 December 2011, our department has been actively looking into the feasibility of increasing the borrowing quota for the lending services at public libraries in future. To implement this new policy, we are now seriously and thoroughly examining the issue against all the factors involved, including the resources implication, impact to the library operation and collection development as well as the long-term development of the public library services in HKPL. In this regard, a Task Group has been formed to conduct a feasibility study of increasing the borrowing quota with a view to enhancing the library services for the benefit of the community at large. The concerns and questions that you raised in your e-mail, particularly for a number of current facts and figures on our library services, such as: readers’ borrowing pattern, annual circulation figures of library materials, total book funds and items of new library material acquired per annum, will be fully studied by the Task Group in reviewing and recommending a realistic level of adjustment of the borrowing quota of library materials to the Department for consideration. Please be assured that the issue has been accorded in high priority amongst all other new initiatives of HKPL. Thank you once again for your valuable suggestions and your support for our library services. Should there be any further enquiries, please feel free to contact the undersigned or Mr YAM Kin-pang at 2601 8980. Thank you for your response. I was unable to reply earlier because I was working on a writing assignment in the last two weeks. Unfortunately, I again cannot utilize any of the Public Libraries’ resources for my work, as our borrowing quota were still used up. Yet I knew that I must reply, as after reading your response I now have more questions than before. In response to your reply, I want to make several points. First, I agree that increasing the convenience for readers to borrow and return items are important improvements. Enhancing the accessibility of library resources is a crucial aspect for any library. Yet in the end, accessibility is only a facilitating factor to accomplish the Public Libraries’ fundamental goal. That goal is to meet the needs of its readers. The most basic among those needs are for readers to be able to borrow books. Yet the fact is that there are readers who want to borrow more books, but are unable to due to policy restrictions. Second, I must clarify the intentions of our previous suggested policy changes. They were never meant to be fully worked out proposals ready for the Public Libraries to implement immediately. Surely you, as an expert of the library system, did not expect mere outsiders like us can do so? Our suggestions were meant to act as a stimulus. To prompt the Public Libraries into devising means to meet its reader’s needs. In the end, readers are not mainly concerned about the type of policy implemented. They care mostly about whether such policies can help them. The Public Libraries were meant to serve its readers, not the policies it created. Third, I must frankly admit that I am puzzled by the figures that you have mentioned in your reply. They did not reflect the actual situation clearly, and some, to a certain extent, were misleading. Here are my queries regarding such figures. Although the Public Libraries have 4 million registered users, not all of them necessarily borrow books. A more accurate figure would be the number of active readers. The Public Libraries have loaned out 60 million books and accessories each year. I prefer to know the respective number of books and accessories that were borrowed in the peak month(s) of borrowing activity in a year. I have no idea how you came up with the figure of a 15% increase in borrowing. Based on your previous assumption and data, even a 4 million increase in borrowed items, against the existing 60 million items, shall give only a 6% increase approximately. Please clarify if there were other hidden influencing factors. Even then, I must doubt the possibility that all 4 million registered readers shall borrow one book from the Public Libraries simultaneously. Hence it is improbable that an increase of one borrowing quota shall immediately lead to an increase of 4 million borrowed items. Lastly, in order for the Public Libraries to determine whether they should increase their borrowing quota, it only needs to ask four questions. Note that these should be based on data from the last five years, from 2006 to 2011. How many readers have borrowed at least one book each year? How many books were actually loaned out each year? How much funding did the Public Libraries receive for its operations each year? What is the increase in the number of books in the Public Libraries each year? If the data trends show that answers to (a) and (b) are decreasing, yet those for (c) and (d) are increasing, then the case is settled. No shortage in manpower or other resources shall result from an increase in borrowing quota. According to the said scenario for the above questions, the Public Libraries’ resources are becoming increasingly under-utilized. Hence increasing the borrowing quota shall be a viable method for the Public Libraries’ resources to be utilized more fully. I urge the Public Libraries to disclose data relevant to the above questions, so that we can justify and immediately implement an increase in borrowing quota. I refer to your e-mail of 7.11.2011 addressed to the Chief Executive concerning the services of the Hong Kong Public Libraries (HKPL). Further to our initial reply on 18.11.2011, I am authorized to give you a substantive reply as below. First of all, we are pleased that the initiatives launched by the HKPL to extend the library opening hours of all major and district libraries and to provide book drops at three major MTR interchange stations on a trial basis have your support. As a matter of fact, we are committed to enhancing and improving our library services and facilities to meet the changing needs and aspirations of the community. In addition to the above two initiatives, in the past couple of years, we have opened a number of new libraries and introduced new computerized library and information services for free use by the public. We have also enhanced our online service to enable readers to use our e-resources, such as e-Books and online databases, via the library homepage to support their research and private study at their own pace and at any time and place convenient to them. A new and integrated library system will be introduced in a month’s time to further enhance the core functions of the library services. At the same time, we will implement a pilot scheme on applying the Radio Frequency Identification (RFID) technology at six libraries. Substantial resources have been put into these new projects and initiatives which are aimed at enhancing the library services to the community. During the conversation with our Chief Librarian, Mr YAM Kin-pang on 10.10.2011 and 17.10.2011, Mr YAM explained to your family member the policy considerations and resources implications of your suggestions to issue more than one library card to each borrower with a fee or to increase the borrowing quota of each library card holder. On the former, Mr YAM explained that the issuance of additional library cards or family cards at a fee might not be permissible under the Libraries Regulation (CAP. 132 sub.leg. AL). Regarding your suggestion to increase the existing borrowing quota of six items per reader, you may wish to know that at present there are about 4 million registered borrowers and the total number of library materials loaned out per year is about 60 million items. If the borrowing quota per reader is to be increased by one item, i.e. an increase of about 15%, it is anticipated that there will be substantial increase in the total number of library materials to be loaned out. That said, we will study your proposal, including its implications on the manpower resources and library operation upon the implementation of the new and upgraded library computer system in mid-2012. I am an 18-year old student, and I write to you regarding the services of the Hong Kong Public libraries. As avid readers, my family and I constantly borrow books from the public libraries. Over the years, we saw the government implement various measures that facilitate access to library services. Public libraries are now open the whole week with extended hours. A recent scheme placed collection boxes in MTR stations, while a 24-hour check-out counter is currently being considered. As patrons of the public libraries, we welcome any sensible accessibility improvements to its services. However, we have for years encountered a problem with the basic policy of the public libraries: the borrowing quota. And as my siblings and I grew over the years, the problem has only become more acute. A few weeks ago we reserved 12 books from the library through the online catalogue in advance. These books were for additional reference, including subjects like biographies, history, art, languages, and literature. Unfortunately they all arrived before we were finished with our current books. All our five library cards’ borrowing quotas were full (30 in all). So we were forced to return all reserved books. We also had to pay the $30 reservation fee for nothing. If we had larger quotas, we could borrow those books plus our existing ones to read simultaneously. Yet five cards was the maximum amount that my family can register for. The response we eventually got was that they may consider such measures. However, they admitted the issue was not on their agenda, much less any definite schedule for consideration. They cited that increased borrowing quotas shall require extra resources as an impediment. Other than that, they offered no further help in allowing increased borrowing. After our exchange, we feel that our concerns and suggestions are treated indifferently. It is puzzling why the public libraries are reluctant in implementing measures that increases the borrowing quota. Doing so shall not be overly difficult. The public libraries serve Hong Kong’s entire population. Yet not everyone actually borrows books. Some cardholders rarely use the library’s services. Others never register in the first place in favor of other sources of reading materials. Hence increasing borrowing quota for certain or all readers shall not greatly strain the public libraries’ resources. Lack of difficulty aside, there are other reasons why the public libraries should increase its borrowing quota. The major one is the decreasing readership that libraries face in this electronic age. As portable computers become more prevalent, more information and reading material can be accessed digital form. Many people, particularly the younger generation, mostly read through smart phones, tablet PCs, and other gadgets. Modern society’s reading pattern is no longer bound by paper. As more people join the transition, demand for physical print drops, including books in the libraries. In addition, low fertility is also having an impact on borrowing. Currently Hong Kong ranks among the lowest in terms of fertility. The frequent closure of schools (‘school-killing’ if you will) by the Education Bureau attests to that. With no children there are no students, and the public libraries lose a major reader group. These factors decreases library borrowing rates, and if nothing is done, library services shall soon become obsolete. Regardless, public libraries can still be an important facilitator for public education, despite the digital trend. The Central Library, opened in 2001 with 2 million items, contains many useful resources. Yet they, along with all other libraries’ items, shall go to waste if few ever borrow them. That may soon become true with current rates of electronic advancement and change of reading habits. This threatens the libraries’ very purpose of existence. Action must be taken to encourage readers to utilize the libraries’ resources. However, the Hong Kong Public Libraries has proved to be quite complacent in light of this situation. For sure they have implemented certain improvement measures, like extending opening hours. Yet these are only auxiliary policies. A library’s basic purpose is to lend books, and that is controlled by how many people can borrow. Our current quota of six books per card was implemented from 2000. During these 11 years no review of the policy has ever been done. Now is time to revise this decade-old policy. Increasing the borrowing quota per card encourages borrowing. In addition, readers with larger borrowing demands can better utilize the library’s resources. Given the lack of motivation from the public libraries, we now seek for your help. As Hong Kong citizens, we are glad to have a leaving yet committed Chief Executive who shall work for our best interests until the last instant. Hence, we submit our humble but desperate request to you. We hope that you, as the Chief Executive, and your colleagues can help us on this issue. In the short-term we hope for measures that can quickly allow increased borrowing per card. In the long-term we anticipate actual change to the whole borrowing quota policy. Education is crucial for any society, and libraries have played a pivotal role for centuries. They still can. However, the public libraries shall gradually lose readership if it does not actively encourage borrowing. Eventually they shall have to beg readers to borrow. Thank you very much for your recent order for our LEGO© Universe MMOG! We are very sorry to say that LEGO Universe isn’t currently available in your part of the world. We are working hard to bring LEGO fans from around the globe in to the realms of LEGO Universe, and it will take us some time to make it available worldwide. So don’t fret Adventurer! The LEGO Universe oracles have predicted that you will one day be able to take your rightful place alongside the rest of the Nexus Force, but this fateful day is unknown to us at the current time! We will let you know by email once the game is available in your area. In the meantime, for all the latest and greatest LEGO Universe news, including future development, visit universe.lego.com, and sign up for the LEGO Universe Email Newsletter. For many years I have been an avid fan of Lego. From being a boy to teen, I have always admired such a unique toy: fully tangible yet immensely versatile. It allowed me to bring my imaginations to life, and provided countless hours of fun. To me, nothing can replace this medium of imagination that has become an integral part of my life. Naturally, I was interested in the MMOG Lego Universe when it came out last year. Yet I was put off by the subscription fee required and so refrained from participating. However, the recent free-to-play option rekindled my interest, and I tried it out. I soon decided it was definitely worth the investment. There was just one problem: I lived in Hong Kong, and Asia-Pacific countries are not supported. I was astonished, and disappointed, that the reward for my loyalty to Lego was to be left out of its first digital venture. Lego Universe is touted as a step by Lego into the digital age, while maintaining imagination and creativity as its core ideals. The internet is an ideal medium to distribute this to the world. Yet Lego’s action indicates that only certain people can enjoy it. I personally find this incomprehensible. The internet, as a digital medium, faces none of the traditional distribution barriers of tangible products. Expanding sales to more countries can increase revenue base without adding too much costs. It can also introduce Lego to more countries. The only reason why Lego did not expand its sales is because of its reluctance to step beyond its traditional European and North American markets. Even Australia has been left out. That is the only reason that I can think of. I was all set to subscribe for Lego Universe. The only thing that kept me from doing so was that Lego did not provide it in my country. Who knows how many potential clients are there in the rest of the world? I may be wrong. That is why I now give you a chance to explain why the rest of the world has been neglected by Lego, not only in terms of Lego Universe, but its mainstream products as well.